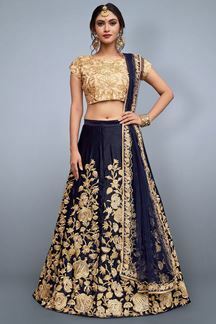 Steal the show as you flaunt this quirky designer lehenga choli set featuring a beige choli done up all over in golden zari patterns while the lehenga falls to the floor in blue with zari and sequin embellishments in floral designs enriching the entire ensemble! This lehenga choli set is accompanied with matching blue net dupatta.Length of choli comes of 13inches with work! Note: Color may slightly vary due to digital photography.